Preferred Properties Landscaping & Masonry: Featured Projects: Nursery, Outdoor Lighting, Mulch, Gardening, Sod and more! Preferred Properties Landscaping has been involved in some very interesting and diversified projects. Preferred Properties takes immense pride in completing these jobs at task. We strive to exceed our customers expectations. We are proud of Preferred’s staff at hand. They are simply the industry’s best. Take a look at our Featured Project Photo Gallery below and our Recent Projects Gallery and see for yourself. Preferred Properties Landscaping has become an award winning and industry leading residential design build Landscaping firm over the last 2 decades for many reasons. Primarily the dedication and perseverance to supercede their customers' expectations. Preferred Properties Landscaping has been involved in many featured projects. This type of project basis is the special or featured relationship with their client customer. Our vision and their trust enable us to go the extra mile, bring that special touch to the project. Preferred's staff has tremendous ability to design and build the project so deserved by our client. The relationship between Preferred Properties Landscaping and their customer is a trusting bond to discuss desires, budgets, dreams and realities. Lots of times many project choices are brought to the customer’s attention and these possibilities are discussed. Preferred Properties Landscaping is as good as the customer allows us to be. Many featured projects begin with a master plan that is brought to the table and designed and thought of to be the "highest and best use" for the area. The master plan is prioritized and budgeted into phases. That special featured project is considered featured when the phases are coupled together and built as one project. Preferred Properties Landscaping has become the industry leader in residential planting design, specimen plant material finder, masonry and stone setting, fire, water, lights and sound. What Makes A Project Become So Special? The homeowner is satisfied with the project. They are emotionally wowed by the project and what the project enables the homeowners to do. Lots of patios are now inclusive of fire pits, fireplaces, sitting walls and built in rock speakers. Lights at night brought into play allow the area to be utilized into the evening hours. Stone and patio material choices are becoming more and more evident as manufacturers are mimicking certain eras, house styles and popular looks. Stone, granite, quartz, travertine, and tumbled limestone are readily available from major stone suppliers. With proper masonry techniques and concrete preparation, these materials can bring that special feeling to the project. Outdoor kitchens with stucco and stone, fiber optic lights in the countertops, limestone flooring and granite patios are well sought out. These types of projects should be designed on paper, texture material samples approved by the homeowner, areas marked out with marking paint and contracts put into place before construction begins. How To Go About Designing And Building A Featured Backyard Oasis? First step out and interview a few landscape designers to get a feel for their charisma and vision of the site. You have to feel comfortable working with such a designer, as he/she becomes your illustrator and project coordinator. In the interview process, ask the designer about the presence before, during and after hours while the project is being built. Lots of designs can be construed on paper, It is very important that the design team is the building team as well. This design build feature by the same company ensures efficient communication and accurate representation of the project to be built. Design build by the same company also eliminates costly overruns and dismantles gray areas of contractor responsibility. When supervised by the designer, it is the responsibility of the designer to enable his crew with the correct vision, print, stone supplies to get the job built as described to the homeowner. Many times when the job is subcontracted out, you get into a feeling of too many chiefs and not enough indians. Varied and numerous interjections on how the project shall turn out. By going with the designer you feel most comfortable with, all you need to do as the homeowner is pick out the best suited design for the area and contract the price for building such project. It is now the responsibility of the design build team to design, build and deliver the project of discussion. If now contractors outside the firm are to be used, they are under the supervision of the designer to perform in a manner that works for all involved. Timing and teamwork are ingredients for a delivered project. Weather plays a factor, materials orders and change orders are integral in time delays for such projects. A good designer at hand will envision the ability to do other parts or phases while they await for such changes to occur. Part of the project decision-making process is financial. The other is emotional. Go with well trusted and successful firm who has daily involvement with design build landscapes and hardscapes. Ask questions about timing of the project start and finish dates. Be straight up with the contractor chosen and ask what parts of the project are difficult, what part is most challenging and what will take the most time. Lots of times projects are spaced out financially for the contractor to balance. The homeowner realizing cash flow is the vitals for getting this done and escalating this to completion. 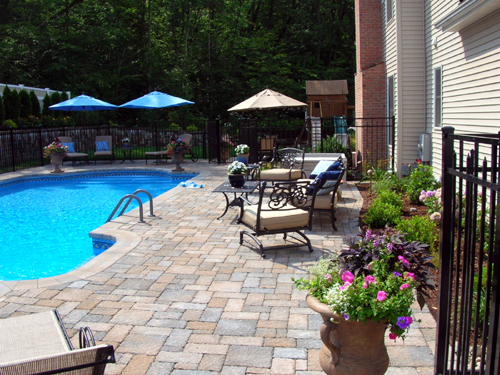 Preferred Properties Landscaping has been involved in many costly renovations and design build projects. This helps greatly when you work with a design build contractor who specializes in this type of work. Good Work is never cheap and cheap work is never good. A fair price for quality work is the best medium to have a great relationship with your contractor and vice versa. Times arise when outside contractors for gas, electrical, plumbing, carpentry and water are required. It is best that a design build firm that has a relationship with such contractors work with these tradesman. The design build firm realizes the abilities of the contractors and necessary provisions are made enabling the project to go as planned and on budget. Do You Realize The Opportunities One Can Build For You Outside? Patio size, layout and accessibility from inside the home has lots to do how the design functions. A good designer can envision and bring out the strengths already present in the existing landscape. For instance, a good patio layout off the deck is to remove the rails across the front of the deck and abut the patio with one long step down onto the patio floor. This way here the vista from the living / kitchen area out across the deck is much more appealing with the rails now missing. WOW. How nice it is to look out and not see the rails of the deck. A simple redesign makes perfect sense. An experienced Landscape designer achieves this. 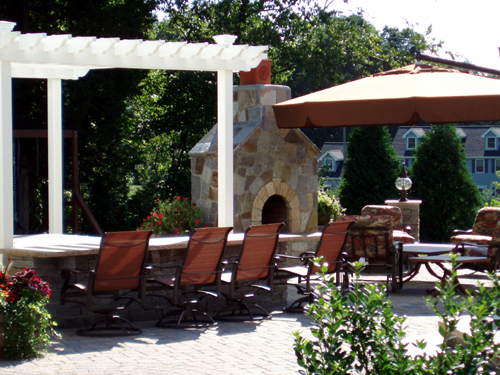 Preferred Properties Landscaping has three designers on staff to assist you with your outdoor needs. 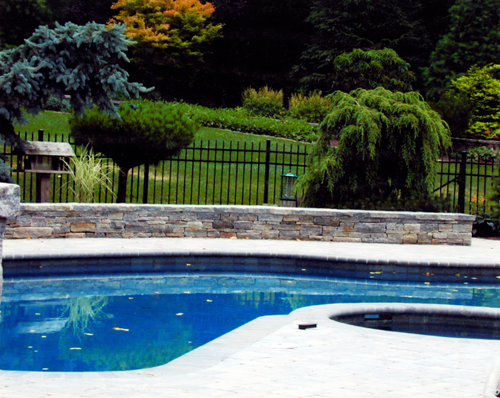 Something as simple as a pool deck to a complete back yard makeover is our everyday specialty. Call today to discuss your needs, desires and dreams. Preferred Properties Landscaping and Masonry is here to assist you no matter what the size of the project.